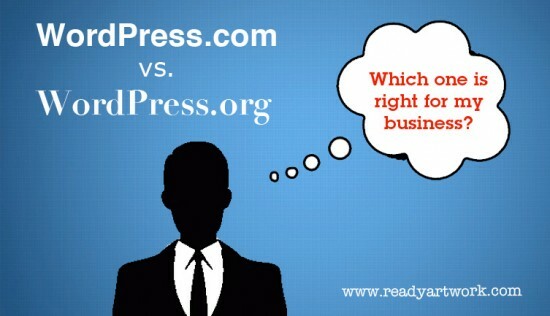 Wordpress.com vs Wordpress.org - Which To Choose? As we have mentioned in our previous blogs, getting a website for your company is one of the best investments you can make. For an established business, having a website is already a given. A website is one of the first things that potential customers turn to when looking for more information on a product or service that they are interested in. Studies have shown, that online leads have a 14.6 percent close rate, while outbound marketing (direct mail, advertisements, etc) leads have a 1.7 percent close rate; therefore highlighting the importance especially for a new business to invest in a good and solid website. If you’re looking to have an informational website for your company, WordPress is the way to go. As the most popular content management system today, WordPress accounts for 22.7% of all websites (W3Techs). 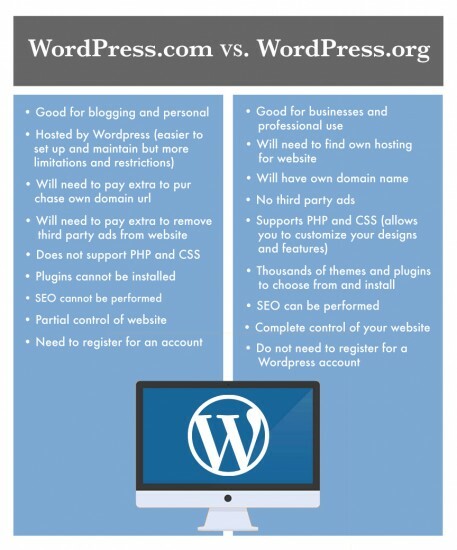 Within this software, there are two versions to choose from, WordPress.com and WordPress.org. So which one is the best fit for your business? Before you can make that decision, it’s time to get to know each platform a little bit more! WordPress.com is a managed platform that allows you to create a website for free and is hosted (also for free) by the WordPress servers. With a WordPress.com website, you will need to register for an account, then choose from a selection of available templates to get started (plugins, and PHP – source code which is used to add custom features and designs cannot be used on WordPress.com websites). One advantage of choosing a WordPress.com site? Installation is easy, and hosting is free. With a WordPress.com website, basic features are available including maintenance for updates, backups, and security. However there are a number of features which can only be used once purchased at a premium cost. Some features include: removal of third party ads on your site ($30/yr cost), ‘custom design’ package which will give you some limited control over your website design such as changing fonts and making basic changes ($30/yr), extra storage ($20/yr), and more. Also, as a website hosted by WordPress, it would need to abide to the terms and conditions your account has agreed to. Pros: low cost and maintenance, cons: limitations on website abilities and features. WordPress.org is a self-hosted, open source platform; which means it is a community based platform where many people can contribute, share, and use each other’s templates and plugins. With WordPress.org, you do not need to register for an account with WordPress and so there are no limitations as to what you can and cannot do with your website. The main advantage of a having a WordPress.org site? You have complete control over your website design and features. The only thing missing from this version is website hosting which you must find and pay for on your own. Costs for this may vary however, you can generally find hosting services ranging from around $7-$15/month. So which option is best for YOU? When deciding on a version to choose, there are several things you should consider, and the cost should not be the primary factor in your decision. Whether you decide to choose a .com or .org website, you will need to make some sort of payment in the end. Therefore you really need to think about the underlying goal of your website. For blogging or a personal site, WordPress.com offers a great and inexpensive way to share your thoughts and images as design limitations and third party ads would not affect you too much. However if you are looking to run a website for a professional business or company, you would most likely want to have complete control of the site that would be representing your business, therefore WordPress.org would be your best choice.